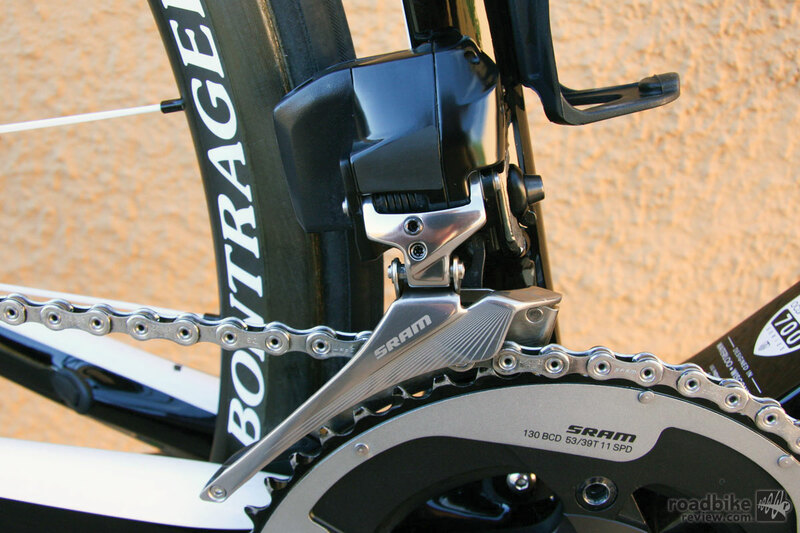 Although unannounced, everybody knows by now that SRAM is coming out with a wireless, electronic drivetrain. In the press, the system has become to be known as “eTap”. 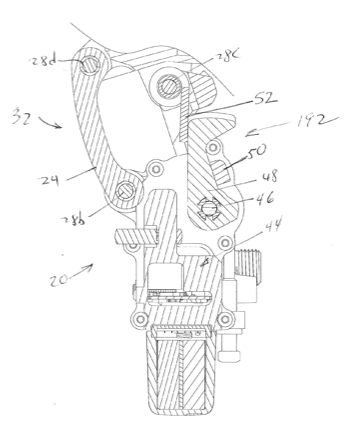 Judging from SRAM’s Valentine’s Day 2014 trademark application, which describes SRAM’s intent to use ETAP with “Bicycle parts, namely, gear shifting mechanisms, brakes, cranks and derailleurs,” the groupset will likely be branded as eTap. 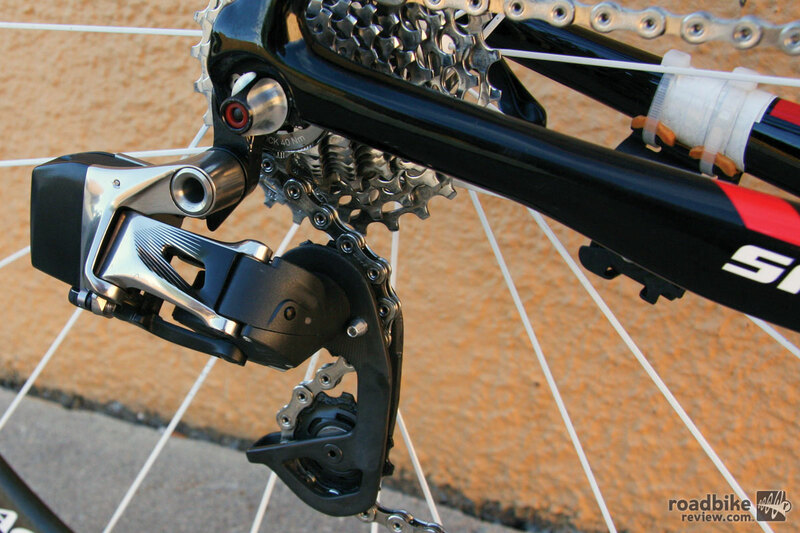 An interesting innovation disclosed in the application is how the SRAM rear derailleur accounts for impacts without damaging the internal gearing – simply, the connection between the internal gears and the parallelogram includes a dutch spring mechanism that can absorb any impacts without transferring the impact to the internal gears. In FIGs. 15a, 15b, and 15c below, the views are looking up from below the derailleur such that the rear wheel and in-board direction are to the right. 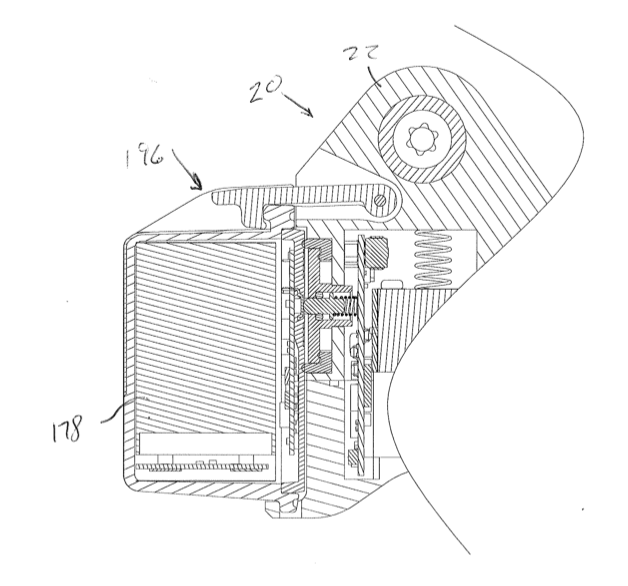 As shown below, the leg 52a of the spring 52 deflects to absorb an impact from the left. In the event of a crash or other side impact (a force directed from left to right in FIGS. 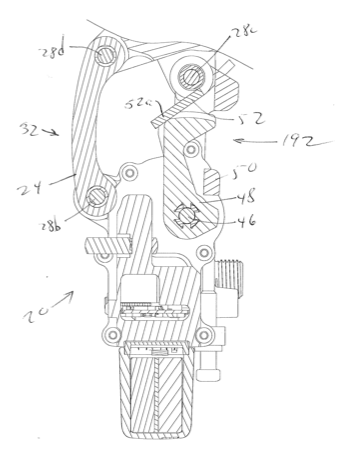 15a, b and c), if the force of the impact overcomes the preload in the torsion-type dutch spring 52, the links of the linkage 32 rotate clockwise about their pivot pins 28, deflecting the leg 52a of the spring as shown in FIG. 15b. Thus, the linkage 32 is able to move without imparting any movement to the gears 106 in the gearbox 44. 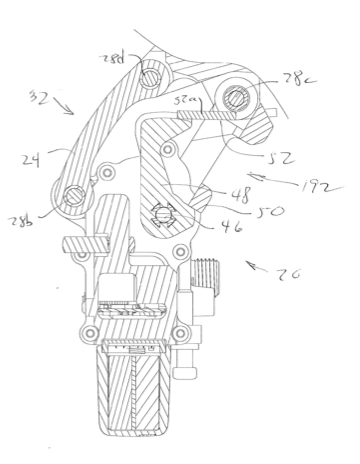 When the impact force is removed from the derailleur 20, the spring leg 52a will push against the drive arm 48 and cause the derailleur to go back to its normal state shown in FIG. 15a. 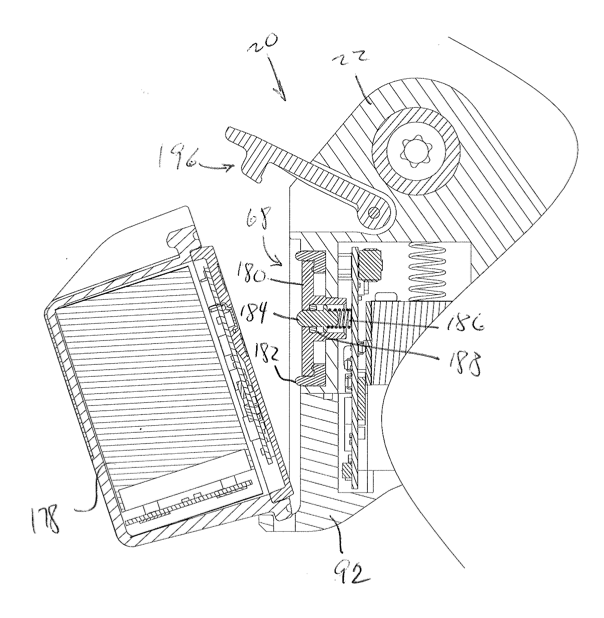 And, as expected in a wireless system, the derailleur includes a radio chip 194, but not much more than that is disclosed about the radio chip 194 in this application.